After nearly 10 months of trying to reach a fair contract with “Verigreedy,” 39,000 CWA and IBEW working families went on strike as of 6 a.m., Wednesday April 13. 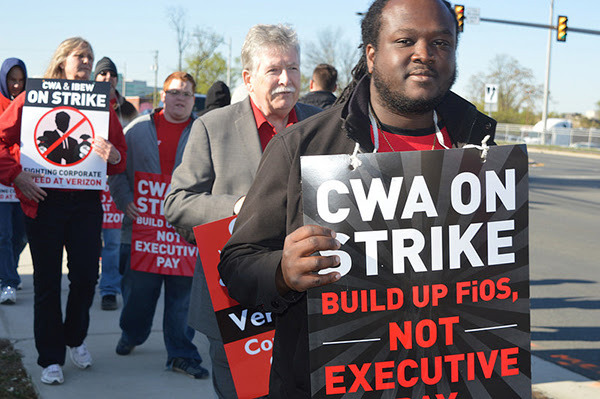 Elected officials across Verizon territory are rallying with striking Verizon workers, and CWA members were joined by AFL-CIO activists and other supporters as the strike continued. CWA Verizon members tell their stories. Watch here. Watch all the CWA Verizon videos here. Despite making record profits – $39 billion in profits over the last three years – Verizon executives have been pushing to offshore more jobs to the Philippines, Mexico and other locations, close call centers, outsource work to low-wage contractors and transfer workers away from their families for up to four months at a time. Verizon workers also are frustrated with the company’s continued refusal to meet its commitment to regulators and communities and build out high-speed FiOS broadband. Not only has Verizon failed to bring this telecommunications service to communities, it is failing to properly maintain the copper network, putting consumers and communities at risk. Union members were out at 6 a.m. on Wednesday on picket lines from Virginia to Massachusetts. There were rallies, mass picketing, visits and messages of support from elected officials and community leaders and other shows of solidarity. CWA President Chris Shelton joined members of Local 2222 picketing at a Verizon garage in Falls Church, Va., and told members that standing together, we will take on this greedy corporation and win. “We’re going to show this company that we deserve a decent life for ourselves and our families,” he said. Keep up with everything happening in the Verizon strike. Check standuptoverizon.com for a map of events, and join a picket line in your area. Check in on the CWA app, a great place to find events and photos. If you haven’t downloaded the app yet, click here. Take action and sign the petition. Check out more photos from the strike here.